The Urban eTruck is based on a heavy-duty, three-axle short-radius Mercedes distribution truck. The drivetrain was replaced by an electrically driven rear axle developed for the Mercedes Citaro hybrid bus. Daimler has announced that its Mercedes-Benz truck division will begin sales of an all-electric semi truck within the next five years. This truck, called the Mercedes-Benz Urban eTruck, will have a range of 120 miles (NEDC) per charge and will be capable of hauling up to 26 tons of cargo. Batter capacity is listed at 212 kWh. Though only few details are out there in regards to Tesla’s recently announced semi truck, the consensus is that Tesla’s truck will directly compete with M-B’s Urban eTruck. M-B says that its eTruck is designed for inner-city transport. Therefore, its short range won’t be an issue. The latest proof of this development is provided by the world premiere of the Mercedes-Benz Urban eTruck, which shows the way to emission-free mobility in short-radius distribution with heavy-duty trucks. Technically, the Mercedes-Benz Urban eTruck is based on a heavy-duty three-axle short-radius distribution truck from Mercedes-Benz. Apart from that, however, the developers at Daimler Trucks have totally revised the drive concept, the entire conventional drivetrain being replaced by an electrically driven rear axle with electric motors directly adjacent to the wheel hubs. Their maximum output is 2 x 125 kW, while the peak torque is 2 x 500 Nm. In combination with the gearing, the torque at the wheel reaches 11 000 Nm. The power is supplied by a battery pack consisting of three modules of lithium-ion batteries with a total capacity of 212 kWh. 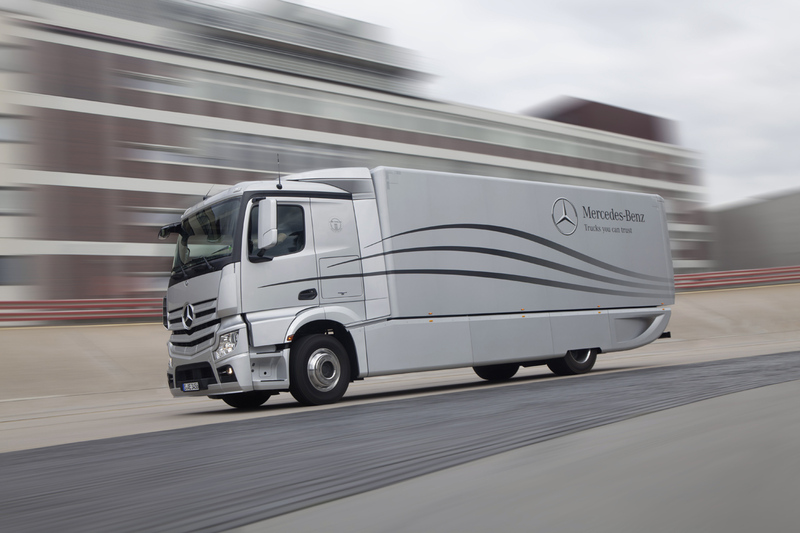 This results in a range of up to 200 km – normally enough for a typical day’s delivery round. Depending on the desired range, the modular battery pack can be customised by adding or removing batteries. The Urban eTruck is connected to the charging station using the Europe-wide standardised Combined Charging System (CCS) Type 2 connector. With a charging power of 100 kW, the fully discharged batteries are charged to 100 percent in two to three hours. Delivering food and products to people, disposing of waste, supplying goods to industry, trade and commerce, taking away the finished products and growing sensitivity to exhaust and noise emissions – the transport of goods in towns and cities around the world is faced with ever greater challenges. While trucks remain indispensable, the demands on them are increasing. As an alternative to the consistent gradual reduction of emissions through ever tighter regulations, the ideal solution is local emission-free mobility – in future also for trucks up to a permissible gross vehicle weight of 26 tonnes. Daimler Trucks is a pioneer in this field. Although electric drives long appeared to be out of the question for trucks, the economic viability of battery-electric trucks is now starting to emerge. This is because of major advances in battery technology: between 1997 and 2025, the costs are likely to fall by 60 percent. At the same time, the power will increase by around 250 percent over the same period. As the EU Commission is in favour of increasing the permissible gross vehicle weight of trucks with alternative drives by up to one tonne, this will more or less cancel out the weight disadvantage of the electric drive. This will raise the permissible gross vehicle weight of the three-axle rigid truck from 25 to 26 tonnes, which will bring the original extra weight down to 700 kg compared with a directly comparable IC-engined truck. As far as light-duty trucks are concerned, the all-electric drive is already a reality. This is demonstrated by the Fuso Canter E-Cell. Following a successful fleet trial in Portugal, the Canter E-Cell has now satisfactorily completed around six months of the first fleet trial for trucks of this kind in Germany. It will be available in future under the name of Fuso eCanter. There will be news about it at the IAA International Motor Show for Commercial Vehicles, which begins on 21 September 2016. Its battery packs with a total capacity of 48 kWh are mounted on the left and right sides of the frame. The electric motor has an output of 110 kW, while the peak torque is 650 Nm. The range of the Canter E-Cell is over 100 km, depending on how the vehicle is used. In Europe, the batteries are charged with the same, standardised connector used also by the Urban eTruck. The vehicle can be fast-charged to 80 percent of its total capacity in just one hour. Alongside Mercedes-Benz and Freightliner, Fuso is the third major brand of Daimler Trucks and a leading manufacturer of “green” light-duty trucks. For example, Fuso Canter Eco Hybrids are in service all around the world. The second generation of the truck has been in production since 2012. The first generation of the all-electric Canter E-Cell was launched by Fuso in 2010, with the second generation following in 2014. In parallel with the current fleet trial in Germany, Fuso is already working on the third generation, which will make the electrically powered Canter even more efficient and suitable for everyday use. 70 Comments on "Mercedes-Benz To Compete With Tesla In Electric Semi Truck Segment"
Just like with passenger cars, we will start with low-range heavy duty trucks. As battery tech gets better, and charging infrastructure improves, the EV trucks will slowing expand their radius from home. Sooner than you think, even large trucks will be 100% EV. And just like with passenger cars it will take a non-traditional truck manufacturing outsider like BYD or Tesla to do it right. 500 kWh would be enough to go 200 miles EPA (4 hours driving). Combined with a 1 GW charging station (it’s been done with buses) and we would be done. I would easily want to pay the cost difference for my freight, just like I can choose everything from ecological to fair trade etc. labeled products. So just like with the cars they start with the range that the spreadsheet mafia came up with, not what the actual people want. And then protest that there wasn’t demand until a entirely different company makes a truck with 500kWh that sells way better. They’ll introduce a new truck 4 years later and tell you that “we’ve cracked the code”. Good job people, good job. Also, add the Scania overhead system for highway and freeway travel so you can travel for hundreds of miles and charge if you need it. And still deliver 200 miles outside of the main road without falling to a stop. They couldn, but they don’t. I have no idea why except for cost. Which isn’t that significant for trucks, most of them are already quite expensive as is. Maybe, but you need 2,5 MWh of battery to match current range. One day driving (10 h) results in 800 km (500 miles) and at least 1 MWh needed… That is far away. No mention of autonomous drive … surely the eventual goal. Autonomous is probably not that important in the short-range delivery segment as you still need someone to load and unload the truck, which usually is the driver. There’ll will be ways around that. They can shift some of the responsibility to the receiver, shown in a way with this amazon drone video. The receiver could be responsible for setting the “placemat” down for each delivery, they can monitor the trucks progress on the iPad (and the computers will verify that someone is there to accept). Then when the truck pulls up and is ready to off load (using automated arm or something) the receiver can be the one who finalizes and says yes, this is the spot, he could also have access to an emergency stop button if something starts to go wrong. Having said that, if there are multiple deliveries, then I would think un-securing and re-securing would be a tricky thing to work out through automation,.. but I bet people are working on a solution. On the smaller scale, I think that is why we see companies just going with an “automated electric skateboard” approach …. because they have no clear idea of what the final vehicle will look like as all the “delivery details” will likely evolve and change rapidly. Here’s an automated fork lift in action. /Looks too heavy and bulky to serve as a “donkey” but I bet they’ll figure something out. That kind of automation has been around for a while. It biggest issue is the fact everything has to be setup just the way it is programmed to be. Tends to require coding everything is for the stuff to be handle just a certain way but if you are a warehouse dealing you can set your systems up to be the way it needs to be to make it work. Not so true on the delivery end. Ok. Well I picked a bad (older) video for an example. The real point of interest hear is AI. Massive data, great processing power and a cloud to get it to all work together means that you don’t have to “code everything” …. the machine will (eventually ) figure it out. This would prove to be quite useful in lowering emissions & improving air quality around towns and cities where stinky diesel trucks spew out a lot of Nox. Exactly! Plus, in the cities there is very little steady state driving today, as various elements contribute to lots of starts and stops, where Diesel (and Gas, or even CNG) is not its most efficient, or cleanest! Electric Drives, on the other hand, are far cleaner at the operational level, and any lack of efficiency they might have while starting out so many times, is at least partly offset by the regenerative breaking aspec, as they slow and stop, if designed right! I do believe you are correct. Despite the article above using the term “semi” at least twice, a careful reading of the actual press release says nothing about a semi tractor, nor the truck pulling a trailer. Instead, the PR uses the term “distribution truck”, which is perhaps the sort of truck you’re talking about; what I’d call a “ten ton truck”; a truck with a fixed position “van” or box on the back part of the frame. The prototype truck in the photos above lacks such a van, but that’s not surprising if they’re just using that prototype to test out the EV powertrain. Anyway, if Mercedes’ idea is to build a van-type heavy duty truck for local deliveries, that makes much more sense than trying to market an EV semi tractor. If so, then it’s not at all a potential competitor for Tesla’s concept for an EV semi tractor. Personal guess the cost difference between a motor that does 36 tonnes and 10 tonnes isn’t enough to make cost sense to use the smaller load version. Actually, the press release quoted above says 26 tonnes, not 36. 26 metric tons (or tonnes) = 57,320 lbs. Weight limits vary by State, but if the guide for the State of Illinois is typical (link below), then a three-axle truck of this type can have a gross vehicle weight limit of up to 54,000 lbs. This article somewhat validates my “napkin math” the other day when talking about electric semi trucks. If they can go 120 miles with 212kWh, then they should be able to reach the 500 miles I was suggesting with 750kWh to 1MW. I think some people were saying they needed 4 or 5 megawatts of battery to go that distance. The problem is the weight when it comes to large batteries. The total allowable weight for tractor+trailer+payload is 80k lbs in the USA, so any weight added to the tractor limits the payload. yes, but even 15,000 lbs of batteries still leaves A LOT of room for stuff to be hauled. I’m guessing most semi trucks don’t come near the 80K limit. As far as I know, the 80 ton limit is pushed by quarry trucks or construction vehicles (hauling stone, dirt, ore, and maybe coal). Another possibility might be oil tankers…refined petroleum probably isn’t that heavy, but hauling crude by truck might come close. I can’t imagine a municipal waste semi having 80 tons in the trailer, nor merchandise shipments (electronics, clothes, auto parts, etc.). Not 80 tons. 80 000 lbs, just over 36 metric tons. Nice analysis. Don’t forget there’s about 1500lbs of fuel that a BEV truck would not have to carry. But that’s somewhat nitty gritty. If a trucker uses 125gal/day, that’s about $300/day. Or about $75k/year. If Tesla (or Merecedes) has some kind of free-Supercharging setup, that wouldn’t take long to get your the EV premium back. Even if they had to pay for their own electricity, the payback is still well within the life of the vehicle. Speaking of which, I think due to the large size of the battery pack, it won’t see a many cycles/day, so it should last a long time. It also looks like the designs so far are set up with liquid thermal management, which would really help. Thanks for your reply, Kdawg. I think I once heard/saw a Tesla spokesman say that for average battery life, they assume the battery pack will be cycled once per week. Contrariwise, I assume the EV semi’s battery will be cycled once per day the truck is driven, which should be 5-6 days a week. So the packs should be cycled 5-6 times as often, which means they would be expected to wear out 5-6 times as fast as a Tesla pack. Now, that’s not to say you’re wrong about cost favoring the EV semi, but I suspect the amortized battery cost is significantly higher than you were estimating. I think there’s little if any question that in the past, the battery cost has been too high to make EV heavy trucks cost-competitive, except in niche applications such as moving semi trailers around in a freight yard. So I submit that the real question here is: Have battery prices recently dropped to the point that an EV truck can now be economically competitive? that’s a nice strawman, but i was referring to long haul trucking were there would have to be a nearly guaranteed 1,000 miles of range. under the kind of pessimistic scenario that i considered, i doubt that the daimler truck would get 120 miles. with local trucking, it’s less of a big deal because with local deliveries, such as delivery of heavy construction equipment, the driver is not necessarily on the go all day and the driver does not have to worry about the 11 hour driving limit. the daimler truck (and apparently the proposed tesla truck) do not appear to compete with the nikola semi, which is a long haul truck. I never said 1000 miles. I said 500 miles. That’s specifically what my “napkin” math was based on. That 120 miles is NEDC, which translates to 70-80 freeway miles. I use 3 kWh/mile on the highway. I haven’t seen any data to contradict that for reasonably aero-optimized tractor-trailers. Bullet-train aerodynamics can do better, but practicality suffers. You use 3kWh/mile in a semi-truck you currently drive? That would be 1500 kWH for 500 miles. So maybe 17 to 20 Tesla packs. the problem is, for a long haul truck (which the daimler truck is not), you insisting on a model that probably isn’t practical for an actual truck driver. 500 miles of range would mean that the driver would have to stop to recharge every day, and probably during the 11 hours of available driving time. 3 hours for a truck driver goes a lot more quickly than you think it does. for example, a truck driver is going to want to have those 3 hours available so that he can make deliveries without having those deliveries eat into his available driving time. the kind of “chill out and relax” stuff that you envision is more likely to occur during his off-duty time. a typical diesel semi has 1,500-2,000 miles of range, which allows a driver about 2 days of driving without having to stop to refill. why would truck driver opt for a bev truck that would require him to stop in the middle of the day every day to recharge? truck driving is not a leisure time activity, so a driver can’t afford to make decisions based on considerations like ev enthusiasm as you can. If range is set at 300 miles a 450 KWh battery on an improved electric truck would be feasible. That 300 miles range could be combined with a fast passive dock based battery exchange system where the exchange is done using the truck’s own hydraulics. The truck comes perpendicular with the dock in front of the battery to be loaded. A truck piston pulls the battery in the truck where the standard front bulge engine compartment use to be. After 300 miles the truck unload the empty battery and move a bit to load another battery wanting charged on the same dock. Simple convenient cheap feasible today. The truck purchase is cheaper than a diesel. The energy service access which comprise getting use of a battery and the electricity charged in it is cheaper than the monthly diesel bill. truck drivers are limited to 11 hours of driving in a day. the pretty much limits you to about 800 miles in a day. in between the reality that most people don’t like to drive to fumes and fuel economy can vary you probably want at least 1,000 miles of range. most trucks have 1,500 to 2,000 miles of range. you should have read some of my replies to kdawg. you can’t assume that truck driving is a leisure time activity, so a typical driver is not likely to have much interest in the “90% of driving needs” crap that you see from ev enthusiasts. getting back to the topic of *this* article, use of electric power for local trucking, both light and heavy duty, seems quite sensible. battery prices will probably need to come down a bit, but in commercial use, you can somewhat predictably evaluate the economics of battery powered vehicles versus gasoline/diesel powered vehicles. If it’s a fleet vehicle with a set route, why can’t there be charging at the loading/unloading stations. Walmart, UPS, USPS, many more. Also, the driver is not going to drive for 11 hours without stopping. So lets say he stops for only 30 minutes for lunch at one of the fleet’s “Oasis stations”, let’s say. At a 600 kW charger that would give him another 100 to 150 miles. Also, if it’s a fleet truck, it may not be up to the driver what he’s driving. If the owner of the fleet is saving tons in fuel costs & maintenance costs, he could want BEV trucks for his whole fleet. All this revolution is thanks to Tesla, now the big players seems to start to take seriously the electrification of transportation. All that Elon envisioned started to happen. Tesla didn’t drive any of this. The development time for a truck like this would have required that this truck be started before/around the release date of the model S. The only thing Tesla had done at that point was the Roadster, which was good, but a niche product. Of course Tesla is driving this. If Tesla wasn’t pushing the EV revolution forward as fast as possible, if Tesla didn’t keep expanding the range of vehicles which the company demonstrates can be made and sold profitably, then Mercedes wouldn’t be talking about putting an EV semi tractor into production. They would at most be talking about building a prototype. Personally, I think it will still be too soon to sell one of these things profitably in 5 years. Smith Electric, for example, has been forced to cease production of its EV heavy trucks because of lack of sales. If UPS and FedEx haven’t yet started wholesale conversion of their local delivery vans to EVs, how many more years are are away we from a commercially competitive long-range EV semi tractor? But committing some resources to R&D for development of such a truck will put Mercedes ahead when the cost and weight of batteries eventually comes down far enough that this sort of truck will be economically competitive with diesel semi trucks. In order for conventional vehicle companies to justify developing their own technology for an EV sedan to compete with Tesla, they need to find other products for that technology. Thus we see Mercedes, Nissan and Tesla get into the home energy storage business, for example. The design is not very aerodynamic. You’re right, it isn’t; though most of the drag comes from the cargo box. Make that aerodynamic, and this chassis would be pretty good. At the speeds an inner city delivery truck would likely be operated at, aerodynamics should be of little if any concern. Finally, someone understands that there’s more to building a vehicle than aerodynamics and putting batteries on it. Combine batteries with overhead power lines for the highway portions of a drive, and we can have all electric trucks sooner. I don’t know what country you live in, but I just don’t see most if any States in the USA installing overhead power lines above all highways to empower long-distance trucking. There might be a case to be made for countries where population density is high, and perhaps in certain areas of the U.S. east coast. But certainly not nationwide. A much better use for that kind of investment would be to revamp and upgrade the U.S. railroads for more efficient and faster movement of freight. Many companies have been involved in commercial electric trucks long before Elon Musk did. Among them are Ian Wright, one of the co-founders of Tesla, who thinks plug-in hybrids are the way to go. Since the commercial trucking fleets use more oil than the passenger fleet, Wright has concentrated his efforts on electrifying commercial vehicles rather than cars. Smith Electric and Balquon were selling electric trucks years ago. A number of other companies have tried and failed in the heavy truck industry, such as Modec and Navistar. Musk did not invent the concept of electric Semi tractors and electric yard mules. Musk doesn’t have any special sauce here excerpt that batteries have improved significantly in the last 8-10 years and are also cheaper making commercialization of the trucking industry a more attractive possibility. Yeah, I can’t figure out why we don’t see more of them – I see hybrid buses, but trucks of various ilks still appear to be almost exclusively ICE. I did end up behind a Smith Electric delivery truck about 3 or 4 years ago, here in the DC area, but that’s the only one I’ve ever noticed, anywhere. BEV short haul and local delivery trucks for companies like Fed Ex, UPS, and USPS would do wonders compared to their current smelly diesel/gas versions. We have an electric FedEx truck on our route (Ft Collins, CO) It rolled up next to me at the stoplight near work like a giant Prius and I was awe-struck. A huge vehicle without any real clatter is about the coolest thing I’ve ever encountered on the road. In Germany, the German Postal Service (Deutsche Post) is switching to electric delivery vehicles (e-bikes and small delivery trucks), for cost and maintenance reasons. Notably, although they asked around at the German vehicle manufacturers if they had something to offer or would built according to specs required (like accessible from all sides), NONE had something available or wanted to do it (we are talking approx. 30000 EVs over the next years at a rate of 5000 per year). The CEO of Deutsche Post got fed-up by these excuses, so the Postal Service is now actually building its very own EV delivery trucks with a recently acquired subdivison called Streetscooter. They have built 600 already, 2000 more will follow by the end of the year. bev’s make a whole lot of sense for short term commercial vehicles. in addition, that is the kind of application where you can show reasonable break even scenarios which would make the up front additional cost for bev’s look more attractive. Looks like a good start. Europeans can charge at 11 or 22 kw, while us based trucks can charge at 16kw. Enough for an overnight charge up. In the meantime ebusco and byd pack 400kwh, and up to 600 in some cases in the godamn buses… Quite frankly. not impressed. So Daimler has basically announced that they plan to allow Tesla to begin selling an EV-Semi before Daimler. But Daimler left out of their announcement that the Tesla Semi will be supported by a Tesla Semi Supercharger Network for long-haul trips while Daimler eTruck by necessity can’t leave town…thus the “Urban” eTruck. Personally, I’ll be quite surprised if either company produces more than a prototype EV semi in the next 5 years. I don’t see there being much of a market for a short-range semi tractors. There is already a tiny niche market for such semis being used in freight yards, but semis aren’t used much for local deliveries, which is what Mercedes is talking about. Now, if either Tesla or Mercedes was talking about an EV delivery van, that would be considerably more likely to be able to be sold at a profit. But that Secret Tesla Master Plan (Part Two) you’re referring to is a 10-year plan. There’s no indication that Tesla is going to put an EV semi tractor into production within the next 5 years, despite InsideEVs’ apparent misinterpretation of a comment from Tesla saying a Tesla exec was “driving” the Tesla EV semi… probably referring to leading (or “driving”) Tesla’s R&D program, not driving an actual prototype vehicle. They are probably using 2-quadrant controllers versus the more expensive 4-quadrant controllers everyone else is using, similar to the earlier Otis Elevator ‘dynamic braking’ resistor / controller. If this is the only negative the truck has, it will still be a winner. …of course I meant “braking”. Perhaps a cup of de-caf would be best,… anyone?? This won’t compete with teslas truck. This is an inner city truck that will go 70miles/110km in real life range taking 2h to charge… Teslas truck will probably have a 1MWh battery charging with rates up to 1MW, giving the truck 300miles pf real world range charging it up in an hour! Well, it’s good that they’re not trying to hype the range. Calling it an “Urban eTruck” certainly points to limited range, and the designation of “short-radius distribution” makes it clear this isn’t intended for long-distance over-the-road trucking. But it seems to me this will be a rather limited niche product. Local deliveries by truck are usually made with smaller heavy trucks, not tractor-trailer rigs. That’s not to say there isn’t any market at all for this type of EV truck, but I suspect it’s a small one. Now, the designation of a 120 mile range with 212 kWh… that suggests limited operating speed. Again, that may be realistic for “short-range distribution” routes. Based on the back-of-the-envelope calculations I did recently, a 120 mile range at highway speed while pulling a load would need ~288 kWh; 35.85% more battery capacity than what Mercedes is talking about. Given the particulates pollution crisis facing European cities due to dependence on diesels, a vehicle like this should be treated as an emergency priority. Install a reformer with PEM then run biomethanol as a range extender. Did they REALLY need to disguise the styling of a truck? I, too, find that to be pretty ridiculous! It’s obviously a standard cab-over design that’s been converted to EV drive; what’s the point of trying to camouflage the cab style? I think that would just attract attention… which perhaps was Mercedes’ intent. Tesla isn’t the only auto maker who can manipulate the press for free publicity! I invite everyone who took the time to read the above article to visit my website: https://www.transpowerusa.com. TransPower, based in Southern California, has developed and vetted a fleet of electric and hybrid trucks in service, and with these and related innovations has a 5 year first-mover advantage. We are the best-kept secret in this new market and I would be glad to correspond or speak with anyone performing investment diligence in this space about the many advantages of a company in our position. It’s a rebadged Mitsubishi Fuso. So, look that up.